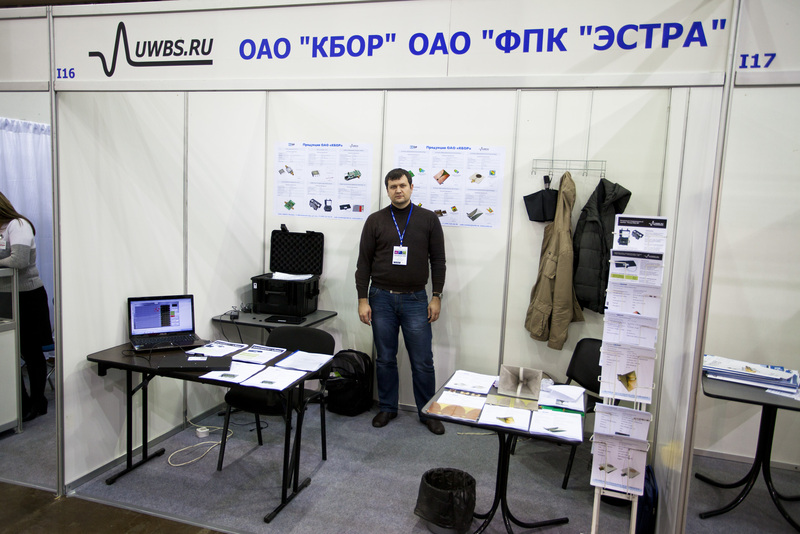 Participation in “Radioelectronics and Instruments 2012” exhibition – Ледомер. Георадар. Контрольно-индикационный прибор Пикор-Лед. Официальный сайт ООО "ФПК "ЭСТРА" производителя георадара Пикор. From October 24th to 26th 2012 JSC KBOR together with JSC FIC Estra participated in "Radio electronics and Instruments exhibition 2012" which was held in St. Petersburg. The company's stand was represented by a wide range of high-tech radio electronic products. In particular, we presented a series of ultra-wideband antennas Antrad for different frequency ranges, both directional and omnidirectional antennas, which main feature is low cost with excellent technical characteristics. Among new products UWB RF modules were mentioned - such as power amplifiers, low noise amplifiers, filters. Were also presented mass-produced devices: ice thickness indicator PicoR-Ice 2M and a device for movement detection behind walls, rubble and other obstacles - PicoR-Bio. This product was caused great interest among exhibition visitors and exhibitors - manufacturers and suppliers of electronic components, industrial equipment, instrumentation and electronics manufacturers. We also established new relations with a lot of customers and partners.